CEH has adopted system-wide performance measures for their community, based on federal HEARTH measures. The Homeless Emergency Assistance and Rapid Transition to Housing, or HEARTH Act, was signed into law in May 2009. The HEARTH Act governs their community’s largest source of federal funding. It amends and reauthorizes the McKinney Vento Homeless Assistance Act with a number of substantial changes, including an increase in emphasis on system performance. 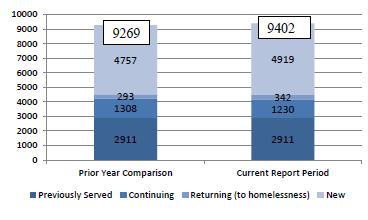 The performance measures include: access/outreach, reductions in the number of persons who experience homelessness (newly and overall), length of time spent homeless and returns to homelessness, along with job and income growth and other accomplishments related to reducing and ending homelessness. By any measure, homelessness is much too common in their community. Annually, over 9,400 households experience homelessness in King County and were served by their shelters and transitional housing programs. Of these, half were homeless for the first time. 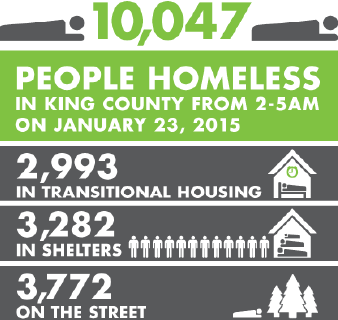 On a single night, in January 2015, more than 3,772 individuals were living outside and another 6,275 individuals were in shelters or transitional housing, per the One Night Count conducted by the Seattle/King County Coalition for the Homeless. Over time, the number of people who are unsheltered in their community has increased. 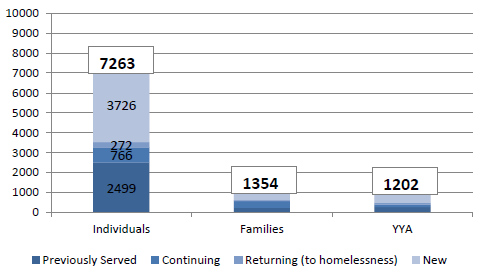 Looking at those served over the course of a full year, our region's crisis response system served over 9,402 households in emergency shelter or transitional housing during the report period. The data source for all charts in this report is the King County Safe Harbors Homeless Management Information System (HMIS). All charts include identified data only. In addition to the overall number, they measure the proportion of persons entering our homeless system for the first time. 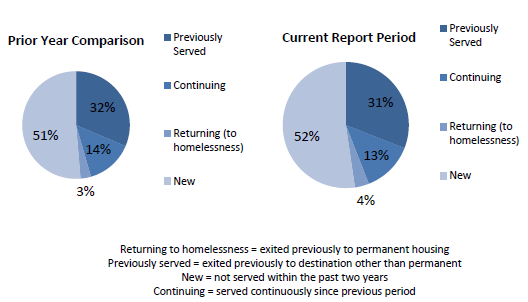 In 2014, 52 percent of those served in emergency shelter or transitional housing were new to the system. Comparing 2013 to 2014, the percentage of new households rose from 51% to 52%. Shortening the length of time families and individuals are homeless reduces trauma and also creates capacity in our crisis response system for others in need. 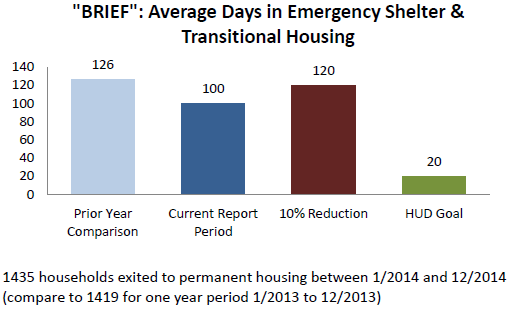 In 2014, households spent an average of 100 days in our crisis response system, far above CEH's goal of 20 days. Comparing 2014 to 2013, the average length of stay was shorter. There is a great deal of variability in the system wide average – it includes very short stays as well as long-term stays. When they consider different interventions within our system, it is clear that emergency shelter stays are shorter than transitional housing stays, and that families spend longer in our crisis response system than single adults (individuals). Their goal is to ensure that homelessness is a one-time occurrence, and those they support to move to permanent housing do not become homeless again and return to our crisis response system. 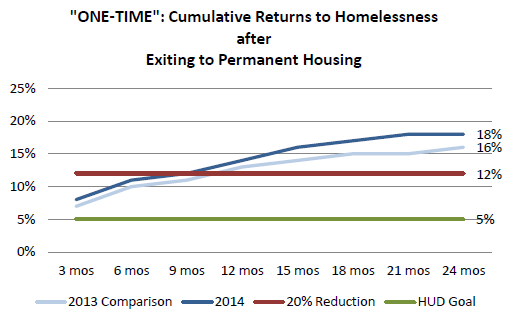 Currently, 82 percent do not return within 2 years, while 18 percent return to homelessness. This is above CEH’s goal of 5 percent returns to homelessness. Comparing 2014 to 2013, the percentage of households exited to permanent housing who then returned to homelessness went up from 16 percent to 18 percent. 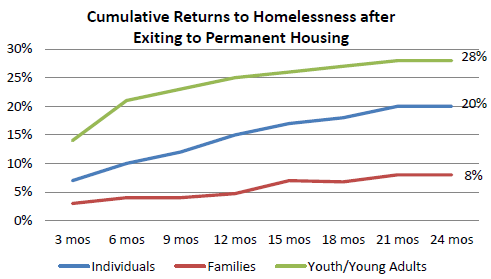 Looking at returns over time, they've learned that the period right after exiting is when most people are vulnerable to returning: one third of households return within the first 3 months after exiting to permanent housing, the next third returns between months 3 and 9, and the final third over the next 15 months. Safe Harbors is King County's Homeless Management Information System (HMIS), used to measure the extent of homelessness in their community. It is a local system used to collect client-level data and data on the provision of housing and services to homeless individuals and families and persons at risk of homelessness. Safe Harbors complies with HUD's data collection, management, and reporting standards. Program staff enter data on all clients served at publicly-funded emergency shelters, transitional and permanent housing programs as well as supportive service and homeless prevention programs. Safe Harbors is supported by the City of Seattle's Human Services Department, and is a joint project of the City of Seattle, King County's Department of Community and Human Services, and United Way of King County. For calendar year 2014, approximately 69 percent of records in HMIS were identified. Identified data refers to records where clients consented to sharing their personally identifiable information, which is used to de-duplicate records. This measure includes all identified households served during the report period and averages their total time in the system. 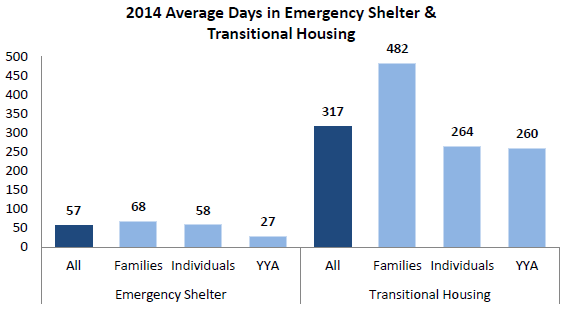 This is measured by the average number of days in emergency shelter and transitional housing. A household is considered ‘returning’ if they left an emergency shelter or transitional housing program to a permanent destination and returned to an emergency shelter or transitional housing program within 2 years post exit. Only identified households are used. Permanent destinations in HMIS are: rental by client, with or without subsidy, owned by client, with or without subsidy, permanent supportive housing for homeless persons and living with friends or family (permanent tenure). The cohort who left to permanent should have a program exit date two years prior to the report period. For instance, if the report period is 1/1/2014 – 12/31/2014, the cohort would be anyone who exited 1/1/2012 – 12/31/2012. The time between the program exit date to permanent housing and the program entry date to emergency shelter or transitional housing should be calculated for each household. If a household returned more than 2 years from their exit date, they should not be counted as a return. Return intervals are calculated in 3 month time periods. If there are multiple returns, the first return date is used.